I thought I would take a few moments to make note of a few of my side hustles with a brief description of each, and how that translates into the overall theme of FIRE. My first side hustle is an ad lockscreen app called Smore. For those unfamiliar with what an ad lockscreen app is, it is essentially an app that allows the user to earn points while viewing content and ads that Smore sponsors. What I like most is that Smore has a low minimum cashout at $1 (100 points) in many useful gift cards, such as Amazon and Google Play. Users earn $0.10 (10 points) a day as long as they unlock their phone screen at least once during the day. The payout in this case is almost immediately emailed to you with the gift card code. 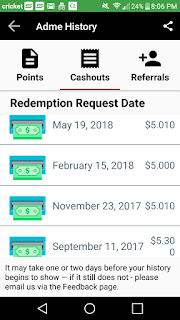 This app generates $36.50 a year in dividend income with everyday use, which isn't bad considering it takes half a second to swipe it away whenever you use your phone. Assuming a 4% dividend yield, it would take a $912.50 investment to match the income of this side hustle (if it could even be considered a side hustle given the relatively minimal effort). 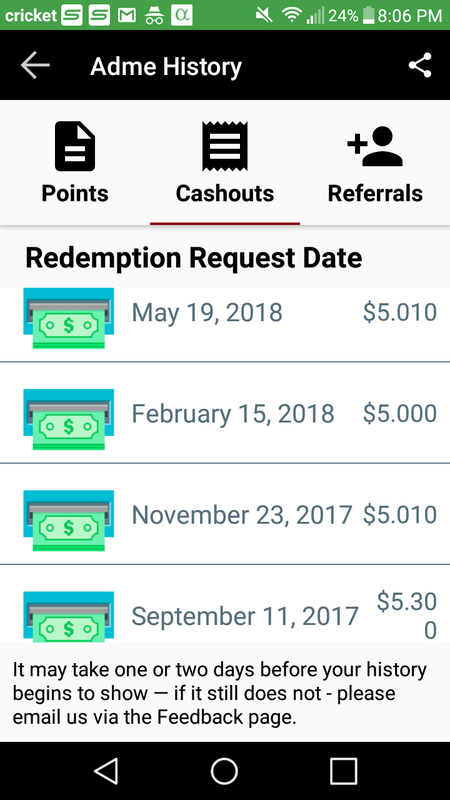 If this side hustle interests you (and why wouldn't it), feel free to use my referral code of R4R4EM so that you can earn an immediate 75 points, and I can earn 100 points after your first 10 days of use. Another similar app that I use is Adme, which has a more variable point system depending upon how often you use your phone. Users can earn a daily bonus of $0.02 by clicking on the Bonuses tab. In viewing my history tab, we can see I cash in roughly every 3 months. This would equate to roughly $20 a year in added income which would require a $500 investment assuming the same 4% yield. Adme allows users to redeem points for Paypal, Amazon, Google Play, and much more. For those interested, my referral code is Adme.mobi/r/TaMCSOgJzB. You would earn $0.30 upon inputting the referral code. The last side hustle that I engage in is Microsoft Rewards. The mobile browser, Edge offers the ability for users to earn 120 points a day (5 points each search), while desktop offers 150 points a day to use Bing. There is also generally the ability to earn 50 points a day through a brief daily poll, 3 question quizzes, etc. In total, I generally earn around 300 points per day through this side hustle. It is a relatively quick process that takes about 6-7 minutes a day to earn the full amount of points. For context, it takes 5,250 points to redeem a $5 Amazon gift card that is sent to your email that you provide when you sign up. I have redeemed $120 of Amazon gift cards from this side hustle. In order to earn that same $120 using a 4% yield, you would need to invest a whopping $3,000! In summary, by implementing these 3 side hustles, I have essentially replicated what a $4,412.50 investment would produce in dividend income at a 4% yield. I consider that to have a tremendously positive impact on my finances as these side hustles have helped provide hundreds of dollars in Amazon gift cards that have partially offset the cost of my textbooks for college. What side hustles do you engage in? How much of an investment would it take for dividends to replicate your side hustle income? There it is Kody. Gotta love those side hustles and I like the report. It is always cool to show how many dollars it would take to invest to earn that same income. That metric always inspires me! Thanks, I'm glad you found the post insightful. As you guys say, every dollar counts!